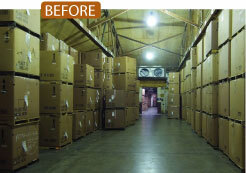 Many fixtures made in the U.S.A.
Hubbell Industrial KOOLBAY® LED luminaires were installed to replace aging less efficient metal halide fixtures. 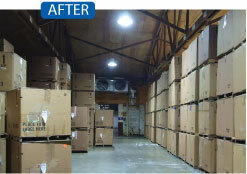 The KOOLBAY’s provided exceptional results not only in lighting the area but with excellent energy savings. The unique LED system coupled with closed optics offer a perfect combination in solving cold storage lighting challenges where temperatures average 0° F (-18°C). Hubbell Industrial Lighting is a proud member of the Hubbell family.